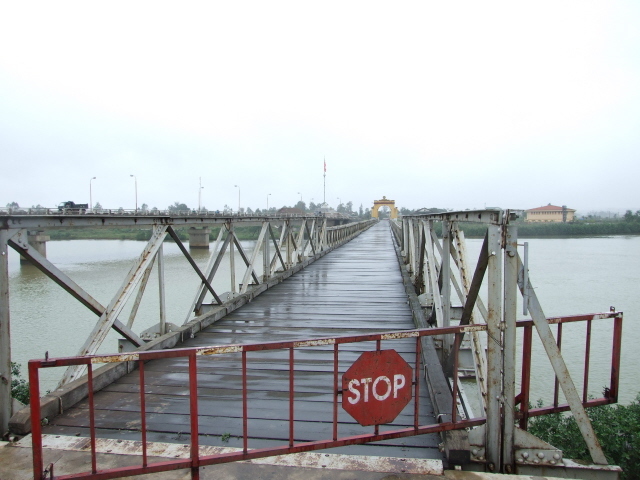 A bridge across the Ben Hai river that formed part of the border between North and South Vietnam from 1954 until reunification and was thus a crucial spot in the DMZ. 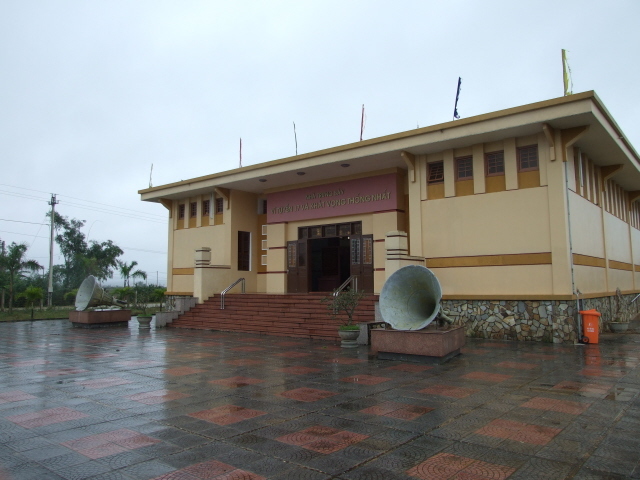 Today it is maintained as a major national monument for the reunification of Vietnam at the end of the Vietnam War, and there's also a museum, propaganda war remnants and two memorials. What there is to see: the old narrow bridge itself, a simple steel construction built by the French, is now just for pedestrians (a parallel modern bridge takes all road traffic across the river these days) and you can walk its entire 180 yards (165m) or so length. 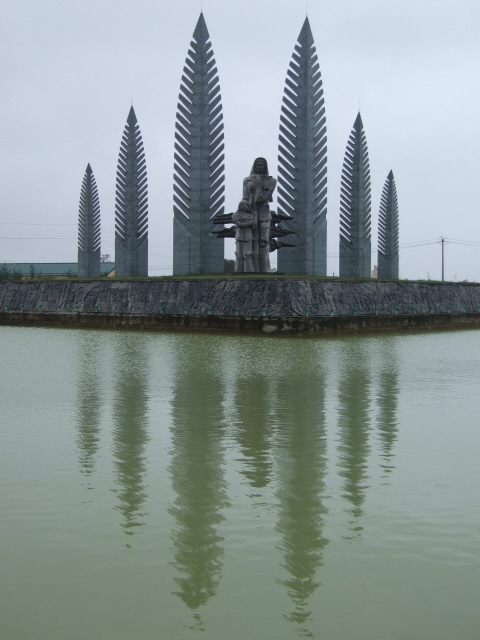 More spectacular than the bridge itself is the huge Reunification Memorial on the southern side. It's actually quite an elegant structure as far as these memorials go. 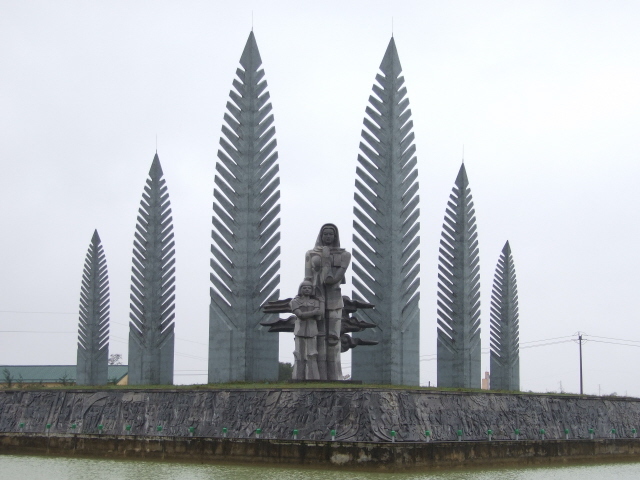 It consists of six feather-like steles and a more traditional statue of a woman and child in front of it. 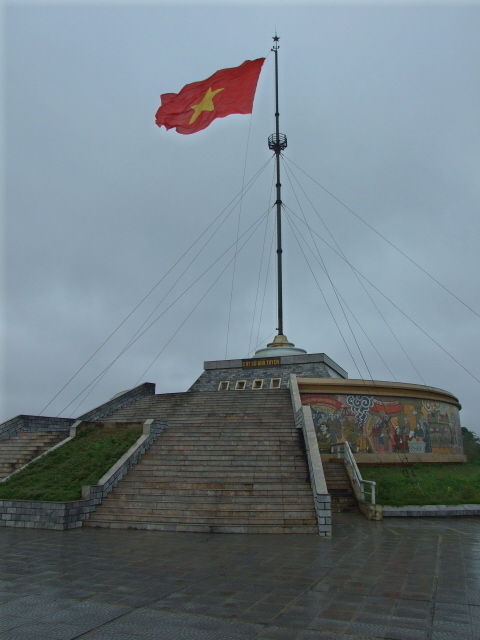 On the north side there's another monument, or rather a massive flagpole resting on a pedestal which is adorned with the most elaborate and biggest socialist realism mosaic I've seen anywhere in Vietnam (or beyond). It's so over the top it's fantastic. 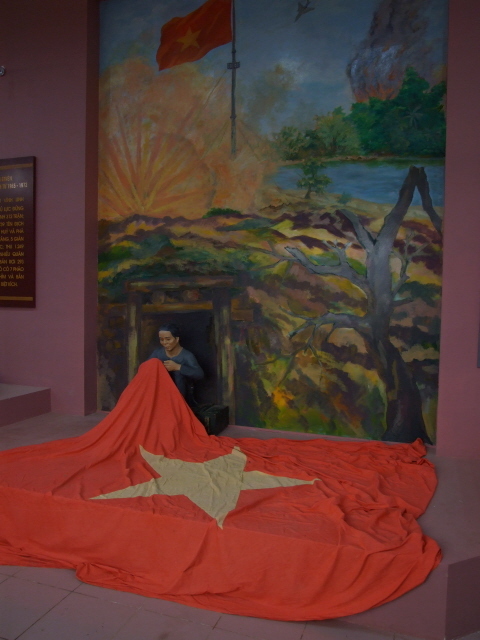 Depicted are scenes of war, life in the tunnels (e.g. at Vinh Moc), planning and negotiation meetings, and so on and so forth, but most prominently: victory celebrations. Uncle Ho (i.e. 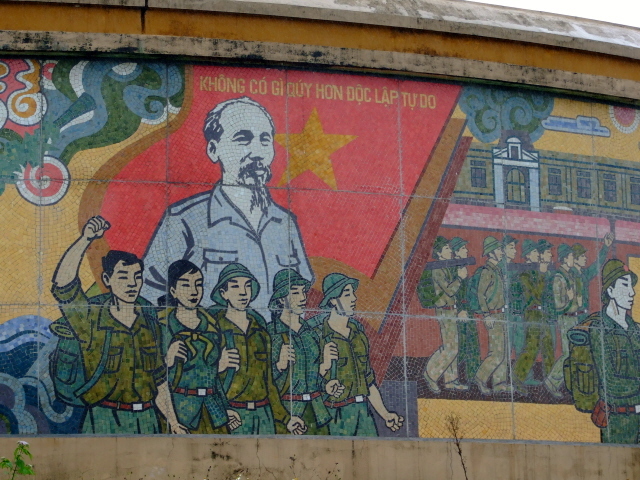 Ho Chi Minh) is also there, looking down on the celebrations with the usually benign facial expression (never mind that he actually died in 1969, many years before this victory). 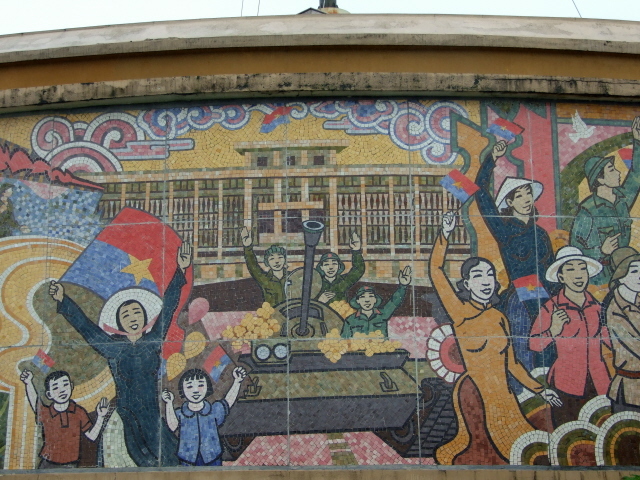 You can make out the Reunification Hall of today's Ho Chi Minh City (the former South Vietnamese capital Saigon – see War Remnants Museum), with a tank in front of it, on top of which happily waving soldiers greet an even happier population. The war was not just glorious, it was great fun – seems to be the message. The level of kitsch is totally captivating. 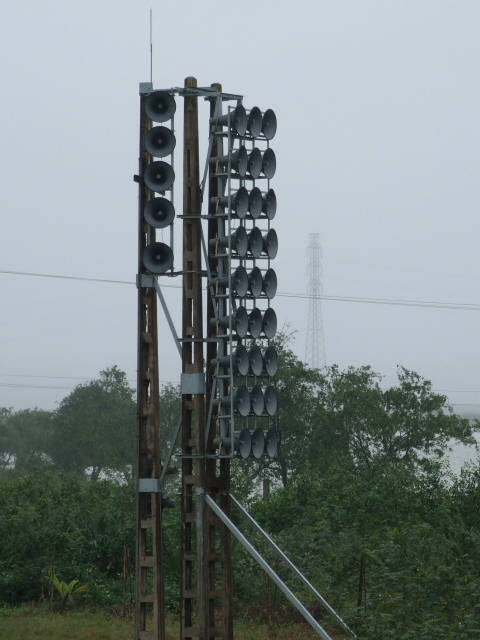 Beside the bridge(s), there are tall stacks of loudspeakers on steel racks – apparently these were used during the years of partition to blast propaganda across to the other riverbank (a type of psychological warfare also employed in North and South Korea's DMZ). These days they are, thankfully, silent. In stilt houses by the loudspeaker stacks scenes of negotiation are stiffly "re-enacted" by some rather crudely made dummies. The site's museum proper is much better, though. Here the OTT glorification continues. 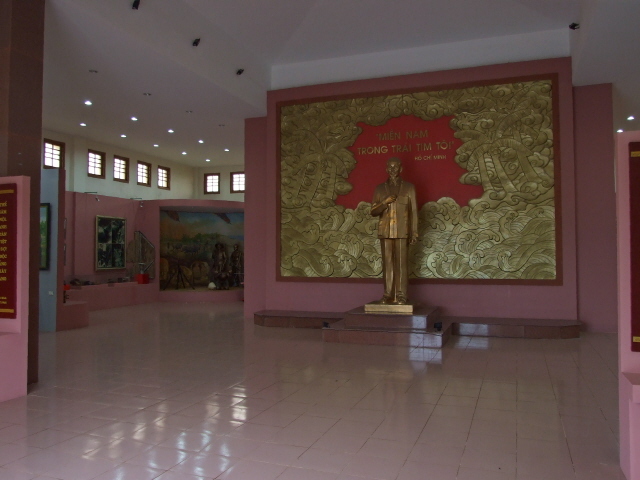 As you enter the museum's wide portal, flanked by even bigger loudspeaker horns, you are first greeted by a tall golden Ho Chi Minh statue standing in front of more gold. 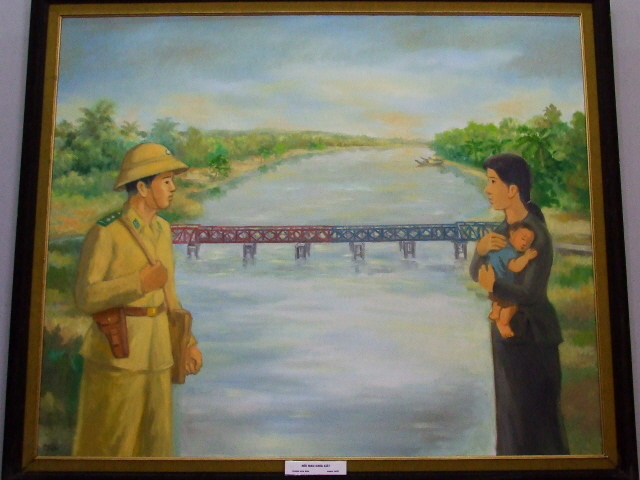 Exhibits include photos from the times of the Vietnam War, and also a painting showing the famously different colours that the bridge itself was painted in during the partition of Vietnam – the northern half was (obviously!) painted red, the southern one blue (although other sources say the southern half was actually yellow). 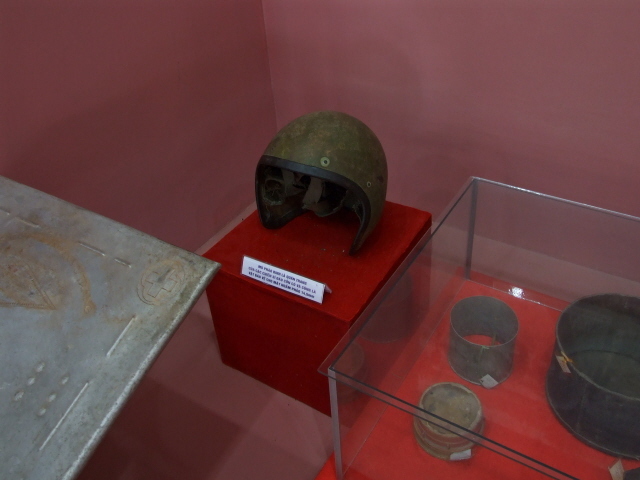 Artefacts include pieces of shot-down American planes, a helmet and bombs of various sorts. The highlight, though, has to be the fantastically over the top life-size diorama depicting the capture of an American pilot. 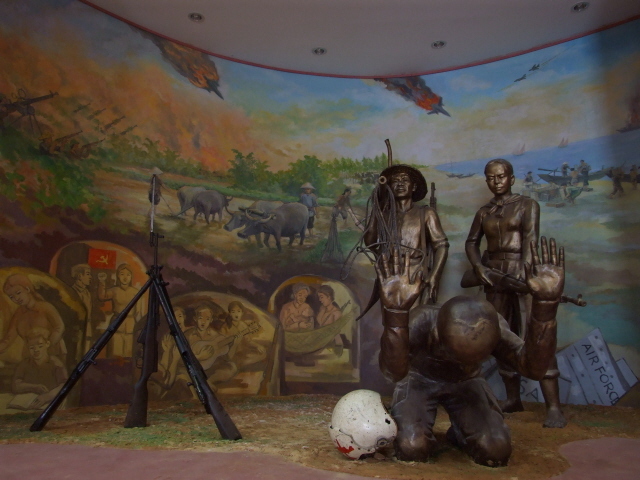 The bronze figure of the "Yankee" is on his knees with hands held up, while two very chuffed looking bronze Vietnamese point guns at him – to the painted backdrop of pastoral rural scenes with peasants and water buffalo on the one side, and scenes of fiery battle with US planes dropping from the sky on the other, while "underneath" everyday life in the (Vinh Moc) tunnels is, again, depicted in a rather romanticized fashion. Another such diorama shows Vietcong fighters emerging from the tiny tunnel entrances (of Cu Chi style) to head straight towards the US forces – in full daylight. In reality, they'd wait for the cover of darkness for their guerrilla attacks rather than run straight into American tank barrels in broad daylight. English signage and descriptive text is scant, but not really necessary – it all speaks eloquently for itself. This is probably the most glamorizing Vietnam War memorial site in the country. 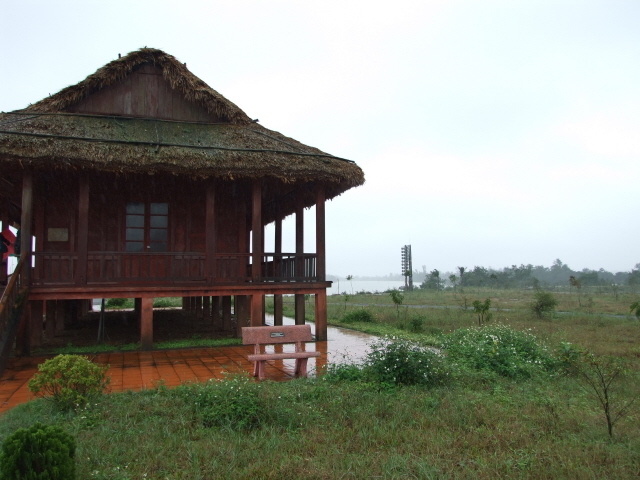 Location: just over 20 miles (35 km) north of Dong Ha in Central Vietnam. 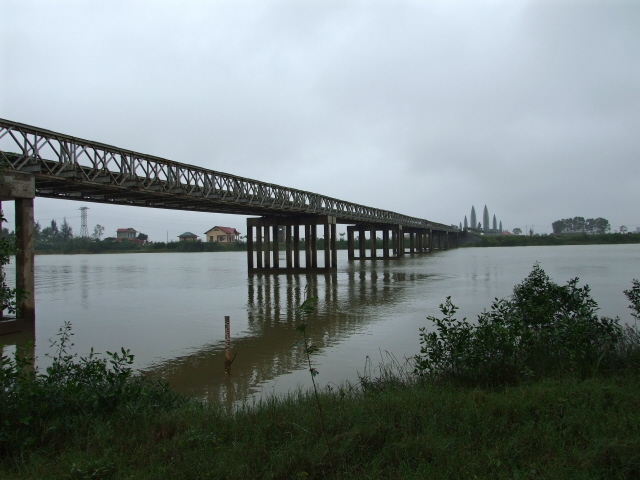 Access and costs: see DMZ – the Hien Long Bridge is by the bridge that takes Highway 1 across the river, which makes the site the most easily independently accessible part of the DMZ, so you could alternatively get here by bus or taxi from Dong Ha. But it's still probably better to incorporate it into a full guided DMZ tour. Time required: between 30 minutes and an hour, depending on how long you want to spend at the museum and how much you want to study the exceptional socialist realism art. 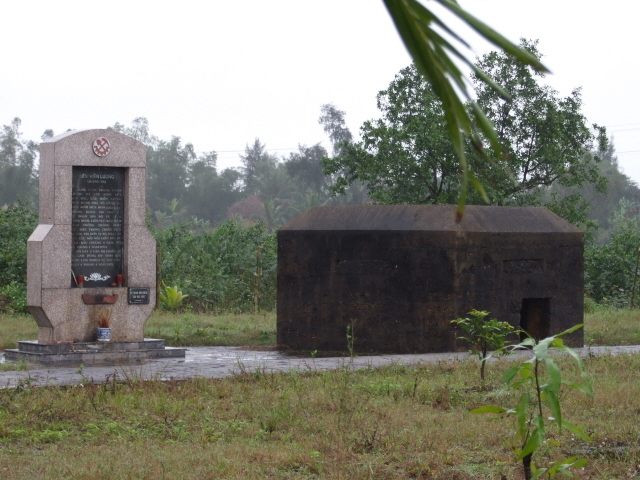 Combinations with other dark destinations: the Vinh Moc tunnels are just a few miles away towards the coast, both the bridge and the tunnels could be incorporated into a longer (two-day) tour of the DMZ. Combinations with non-dark destinations: see DMZ. The many beaches of the area also make for some traditional holidaying, and a few plush new resorts have sprung up. 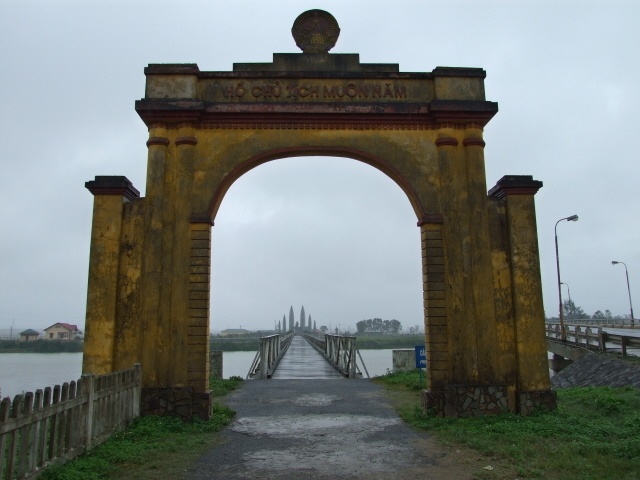 But note that the main holiday season in Vietnam, December to March also coincides with Central Vietnam's rainy season – so those beaches, and the DMZ, may better be visited outside that season.